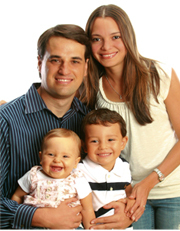 Andres, Giannina and their two children, Elijah and Anabella have been called by the Lord to minister the gospel in the power of the Holy Spirit to the nations. They reside in Houston, Texas. He moved to the United States with his family at a young age. He graduated from Baylor University with a degree in Economics and Chemistry, and was accepted to the University of Texas Medical School. Before beginning his training to become a medical doctor, he had a supernatural encounter with the Holy Spirit that changed the course of his life. In a university exchange program where he had returned to his country to study for six months, he found himself in the midst of a revival where he met the Holy Spirit. The Lord revealed his heart to him and called him to preach the gospel, to pray for the sick, and to take the Fire of the Holy Spirit to the nations. He decided to leave medical school dedicating his life to obeying God’s calling. Giannina was born in Cartagena, Colombia where she surrendered her life to Jesus at the age of fifteen, and soon after that she was called by the Lord to minister to the nations. She moved to the United States after marrying Andres. She is a certified minister under the Assemblies of God, and currently ministers alongside her husband and at women’s conferences around the world.